With this release it's possible to grant access to a password to a user or group that doesn't have access to the password's project. This is a feature that lots of users have demanded. 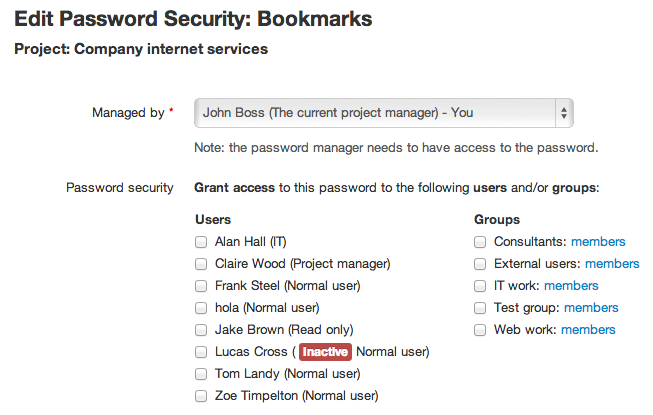 In this screen you can mark those users or groups that you want that they have access to the password. You can also change the password manager (originally the password creator). Team Password Manager now has a system to check if your current installation runs the latest version of the software. The version is automatically checked against our website whenever an admin user signs in and a little message appears on the right hand side of the footer if the version is not current. Of course this can be disabled and the version checked manually. IT users don't have access to all the passwords, only to those that they have been granted access to. IT users cannot create or manage admin users. Only admin users can create other admin users or manage them. Import/export is limited to the passwords or projects that the IT user has access to. This new role is specially important for large organizations where there are some sensitve passwords that only admins must have access to, but where those admins are not in charge of maintaning the software (creating users, setting options, and so on). 2.18.35 introduces the personal passwords list. This new feature allows each user (except those with a "Read only" rule) to have a list of passwords that only she has access to. Even admins can't see the personal passwords of the other users. Even more, each user has her own encryption key to avoid database tampering. Personal passwords don't have all the features of normal passwords. They don't have projects, files or security (only a user can access her personal passwords), but they do have tags for filtering. Users can access their personal passwords list by clicking on the "My account" option from the main menu and then the "My Passwords" tab. We hope you find these new features useful. There are also some minor features, read them on the Change log.